Ambati Rayudu played scored 90 runs to help India post a respectable total. 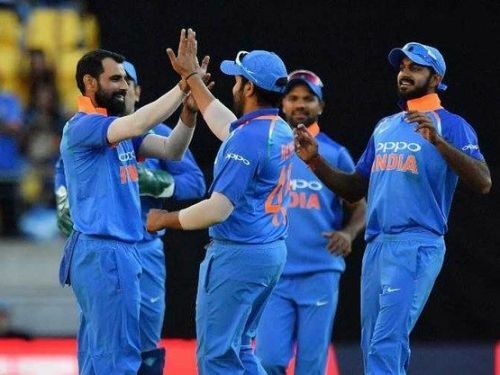 After tasting their first defeat in the 5-match ODI series against New Zealand at Hamilton, the Indian team took on the hosts in the fifth and the final game at Wellington. India's stand-in skipper Rohit Sharma won the toss and decided to bat first in the testing conditions. But, Rohit's decision to bat first backfired as the Indian batsmen once again succumbed to the swinging ball and were reduced to 18/4 inside 10 overs. However, a brilliant innings of 90 runs from Ambati Rayudu along with useful contributions from Vijay Shankar, Kedar Jadhav and Hardik Pandya helped India post a respectable total of 252 in 49.5 overs. For New Zealand, Matt Henry was the most successful bowler as he picked up 4 wickets in his 10 overs. Chasing a decent score of 253, the New Zealand batsmen once again struggled in front of disciplined bowling effort from Indian bowlers and were all out for 217 runs in 44.1 overs to hand India a 4-1 ODI series win. With the match done and dusted, let's see how the players from both sides fared in this encounter. 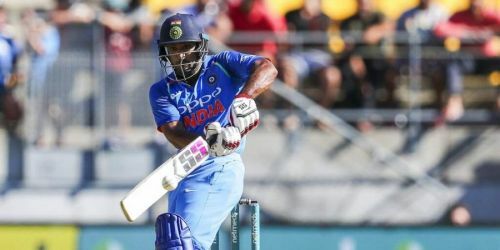 Despite having a good series with the bat, Dhawan's struggles against the left-arm pacers continued as he was dismissed for by Trent Boult for the fourth time in the series. The 19-year-old had a second successive failure with the bat as he was dismissed for just 7 runs when he drove uppishly off the bowling of Matt Henry. After a failure at Hamilton, Ambati Rayudu bounced back with brilliant 90-run knock off 113 balls to help India recover from early blows to post a respectable total. The veteran batsman had a first poor outing with the bat in 2019 as he was dismissed for just 1 run by Trent Boult. However, Dhoni had a superb day in the field as he cunningly effected the run out of dangerous looking Jimmy Neesham. Having got a chance to bat for the first time in his international ODI career, Vijay Shankar showed why he is highly rated in the Indian domestic circuit with a useful knock of 45 runs from 64 balls and also added a crucial 98 runs for the 5th wicket with Ambati Rayudu. Kedar Jadhav had a great match as he chipped in with a 34-run knock off 45 balls and also took the big wicket of New Zealand skipper Kane Williamson. Pandya had a brilliant day as he scored a quickfire 45 runs off just 22 balls to provide finishing touches to Indian innings and also picked 2 wickets with the ball. The right arm medium pacer was taken for few runs by Colin Munro initially, but bounced back to finish the match with an economical spell of 7.1-0-38-1. Mohammed Shami was once again superb with the ball as he sent back both the New Zealand openers cheaply to derail the New Zealand chase. For his brilliant bowling performances throughout the series, Shami was awarded the Player of the Series trophy. The leg spinner was India's best bowler of the match as he picked up 3 wickets in his 10-over spell and conceded just 41 runs.